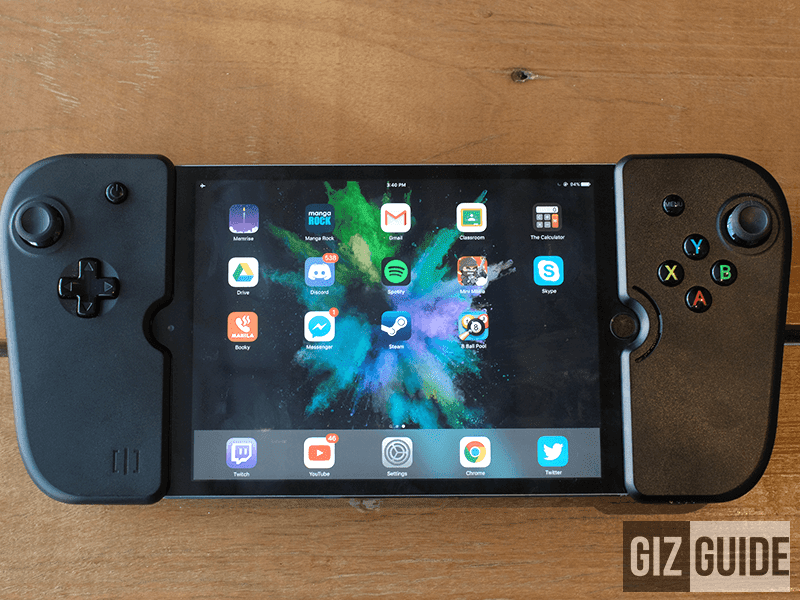 Gamevice For iPhone And iPad Mini Review - Level Up Your iOS Game! 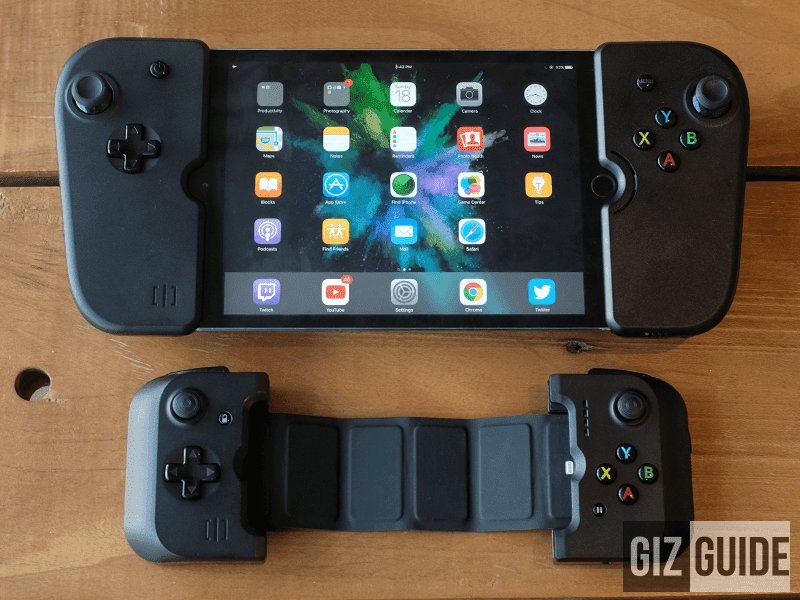 Home / accessories / gamevice / reviews / Gamevice For iPhone And iPad Mini Review - Level Up Your iOS Game! Mobile gaming is on the rise, but on-screen controls still aren't the best. 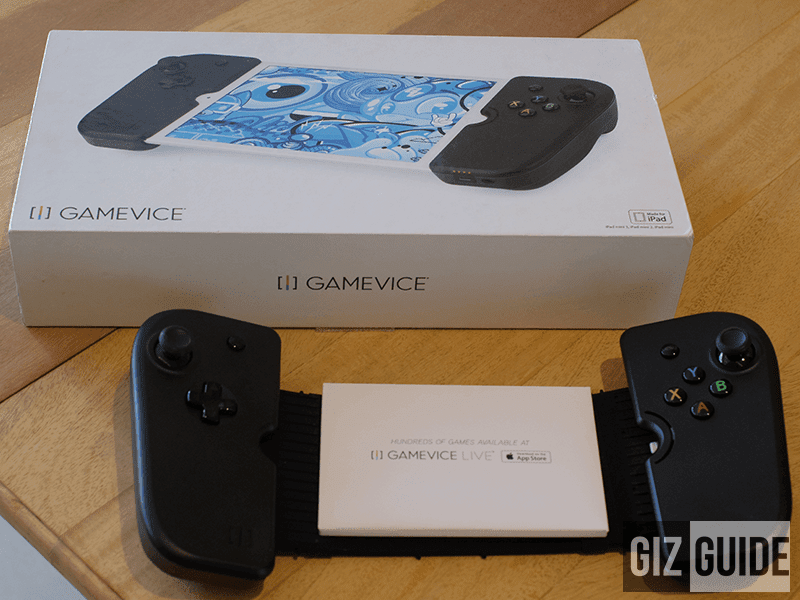 Gamevice a mobile console company aims to make smartphone gaming a better experience! For years gaming on your iOS or Android device has been a mixed bag where some games are able to utilize the touch screen brilliantly. Unfortunately, not all games are like this and some have suffered for it. 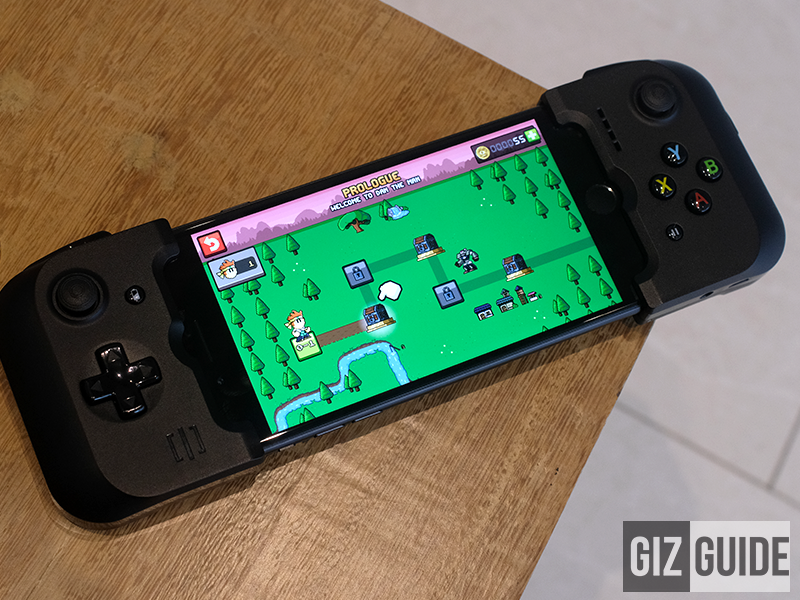 Gamevice a mobile gaming console company has developed several controller accessories where you can dock your iOS or Android device too and aims to improve your gaming experience. 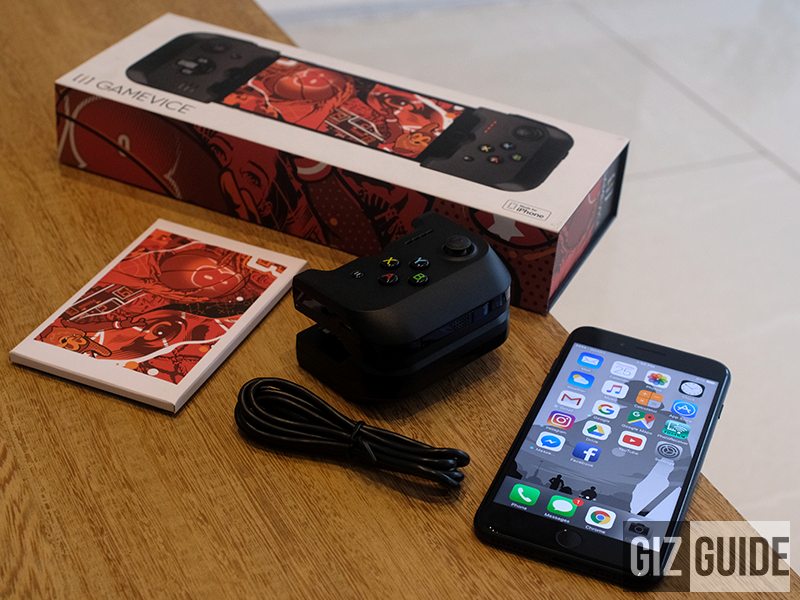 Disclaimer: Gamevice through ARC and Beyond the Box sent us the GameVice for iPhone 6, 6 Plus, 7, 7 Plus and for iPad mini for an honest unbiased review. The boxes for each model are beautiful and are made of similar packaging you would get from an Apple product. Instead of just minimalist box art of the product itself, you get additional colorful designs to make the box pop out of the display rack. Box, documentation, micro USB to USB cable! Inside both boxes are the same with the documentation, the stickers, USB to micro USB/lightning port cord (for iPad), and the controller. It is presented well with all the packaging materials are made of premium material. Deep Grip, lightning connector, headphone jack slot and power level indicator! 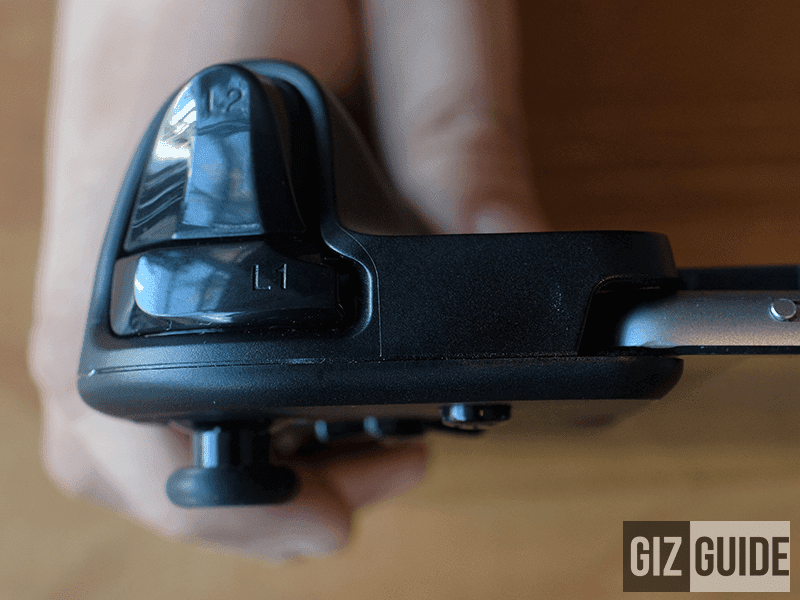 Trigger buttons with analog stick! It is huge and unfoldable unlike the iPhone version! Both controllers are made of textured polycarbonate that feels lightweight but solid at the same time. The buttons are glossy while most of the rest is textured which makes it easy to identify if what you are grasping is a button or not. 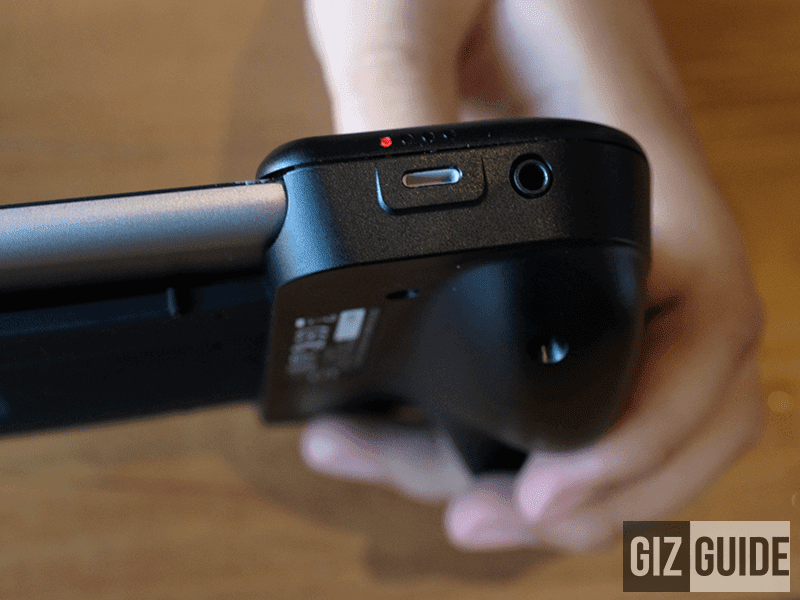 The analog controllers on both versions however could be improved. It is reminds us of the 3DS analog stick that broke after extensive sessions of Super Smash. Speaker, analog stick, XYAB pause buttons and the lighting connector! Left and right trigger buttons are a dream to use! Folded up with iPhone 6s and iPhone 7 Plus! 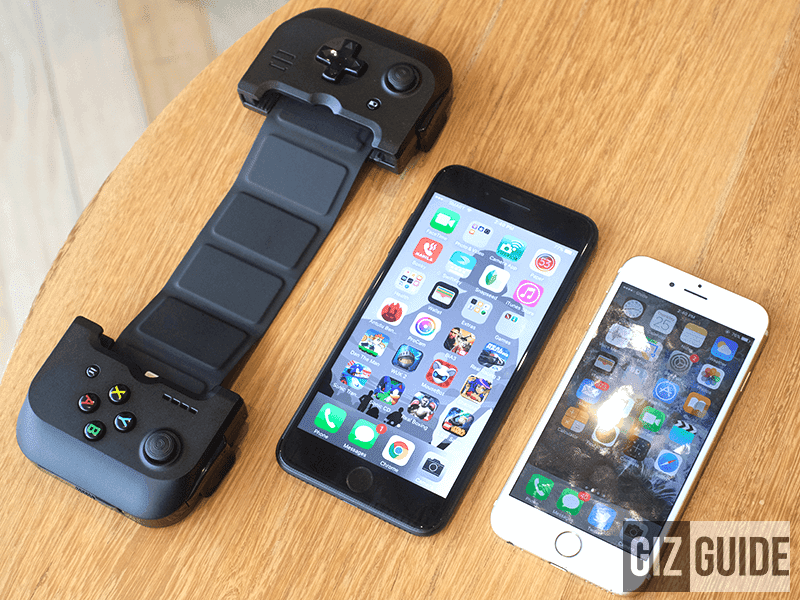 The iPhone controller is like the smaller version of the iPad version with some differences. 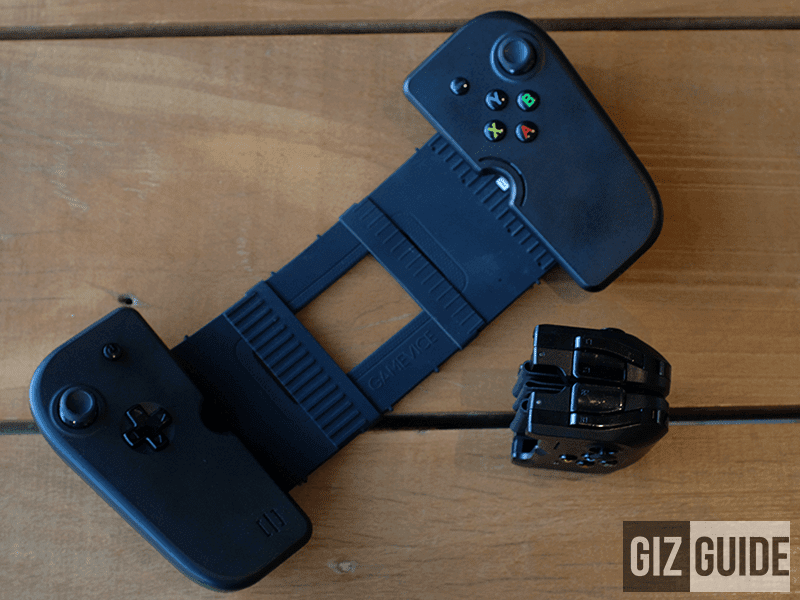 For one, the middle joint that connects the left and right controllers articulates which enables a convenient and pocketable folded mode for when you want to store it neatly with out eating too much space in your pocket. The iPad controller is significantly larger and thus has a deeper grip which makes it better to hold. The only draw back is that the controller itself is on the heavier side and when you add an iPad it may get to heavy for some. The join that connects both the left and the right side also is somehow stiff so you cannot fold it and store in a small amount of space. Both controllers have nice spongy buttons that feel great when pressed with just enough retraction and feedback right after that it is a joy to use. It reminds me of the old Famicoms or the gameboys I used to play with as a kid. 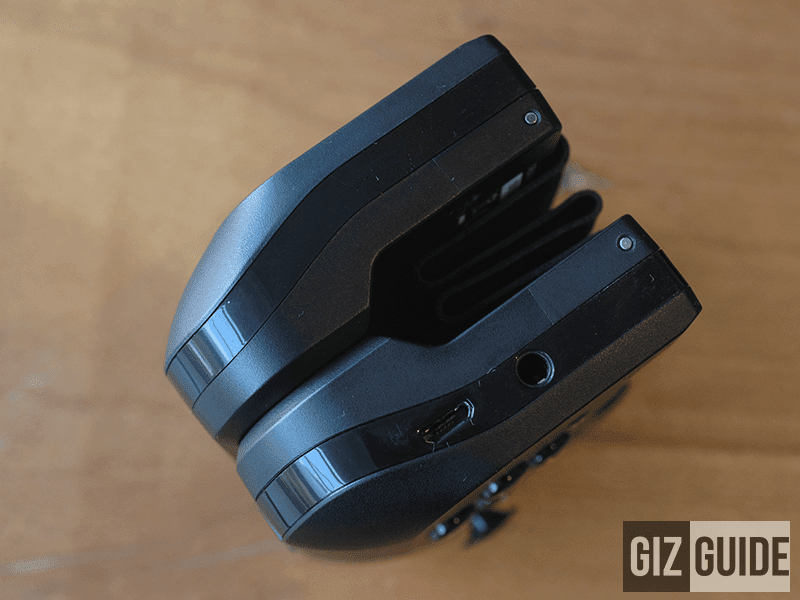 Both models also have a headphone jack! 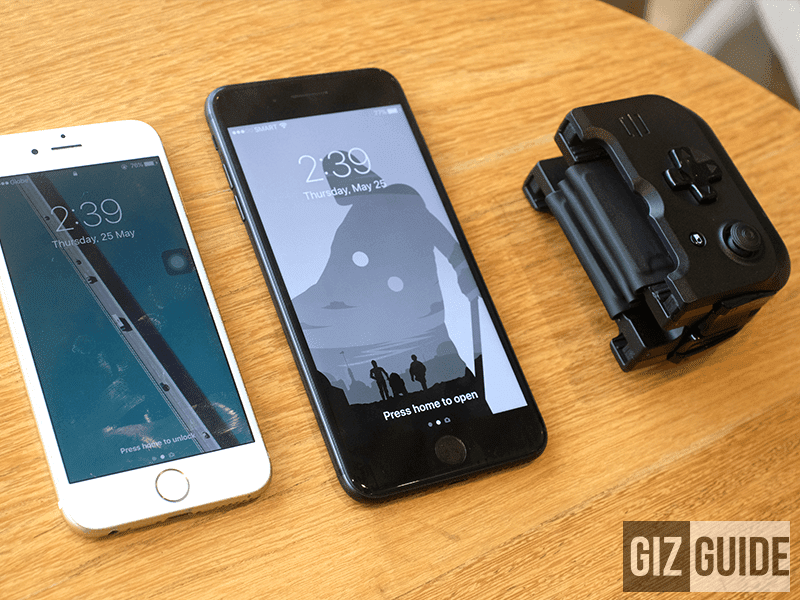 So iPhone users who miss the headphone jack will have even more incentive to get this device! This also helps in deepening the immersion that isolated audio can give! We are comfortably getting an average of at least 6 hours with the iPhone controller while we were getting an average 7 hours with the iPad controller. It is sufficient game time especially with the usual 6 to 7 hour commute in the metro. It takes about an hour to charge the iPhone controller while it takes about under 90 minutes to charge the iPad version. Another difference between the two is that the iPhone version is capable of charging your iPhone but the iPad version did not charge our iPad mini. Performance for this device is a mixed bag. There are not a lot of games that support the controller so you will have to do your own research before purchasing a game or you have to download the game for free and try it. This can be frustrating. 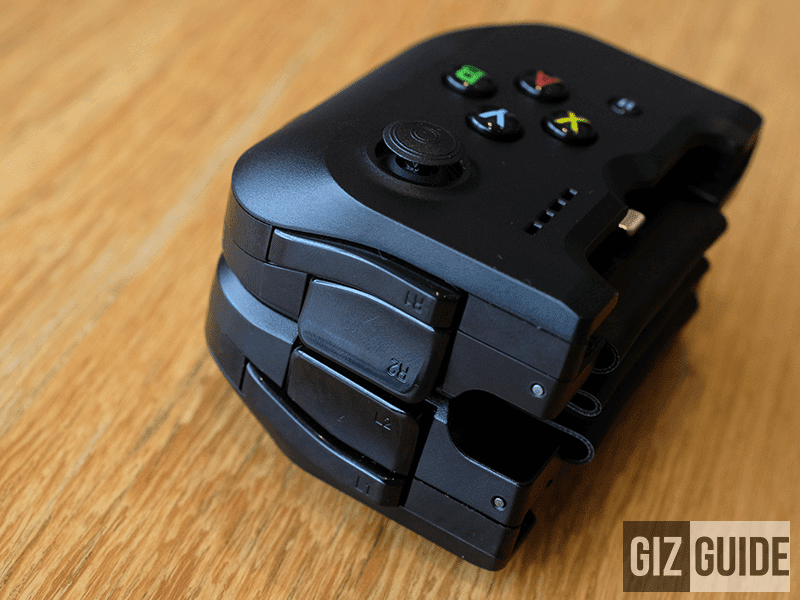 There are several lists of games compatible for the Gamevice that some have compiled into the list. When playing games like Star Wars Lego, and Brothers-In-Arms the response time from when you press the button or direct the analog sticks are instantaneous and accurate. We've almost never had an issue of lag or non-detection. We are happy when it works with the games. We just wish it was compatible with more games. The product is great for adding another layer of immersion when playing compatible games but the price is just too big of an investment. We recommend this product when you can get it on a sale unless you really want that added level of immersion and competitive advantage with good build quality.